There's a new park in town! Get your swimsuits and sunscreen ready because you'll never want to leave the North Myrtle Beach Shark Wake Park, offering up brand new attractions starting in May 2017! Located in the North Myrtle Beach Sports Complex, the wake park is comparable to a skate park or BMX park, only on the pristine waters of a man-made, freshwater lake. The park features a 5-tower full-sized cable and 2-tower cable system, which make it easier to learn the ropes when it comes to wakeboarding and watersports! The park promises to deliver an exciting adventure out on the water with no extra gear or equipment needed. 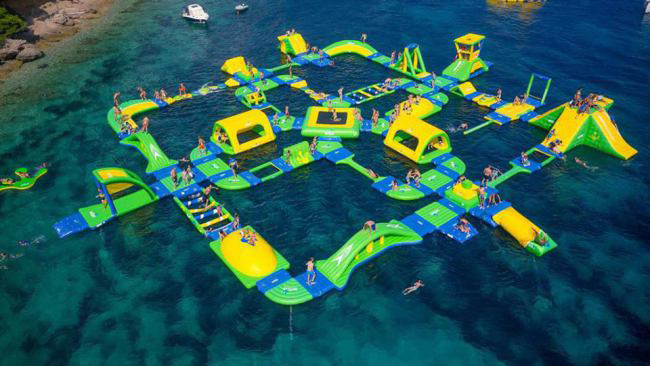 This May, the Shark Wake Park takes things up a notch with its brand new "floating playground," which will offer even more ways to escape the heat, while engaging in outdoor exercise and play. The new portion of the park will include a labyrinth of interconnected inflatable slides, jumping pillows, bouncers, and runways. This floating playground is like an inflatable island of fun, resting atop the gentle waves of the lake. All participants will be required to wear life vests, and multiple lifeguards will patrol the park to ensure the safety of all. The wave park will be based around timed sessions, which allow a certain amount of people to enjoy the experience at one time. Sessions at the wave park will last for 45 minutes, giving visitors plenty of time to enjoy the excitement of the floating playground. Owner Greg Norman Jr. states that the park provides a great and healthy alternative for spending time outdoors in the warmer months. Get the most out of your Myrtle Beach vacation rental by setting aside some time to visit the Shark Wake Park at the North Myrtle Beach Sports Complex on the north end of the Grand Strand. Whether you're going for the wakeboarding or the inflatable water park, you are sure to find a wonderful experience that you won't forget anytime soon!